After the Eindhoven Marathon a design Marathon took place. This hackathon was organized by InnoSportLab Sport&Beweeg, HEX and Sports and Technology. 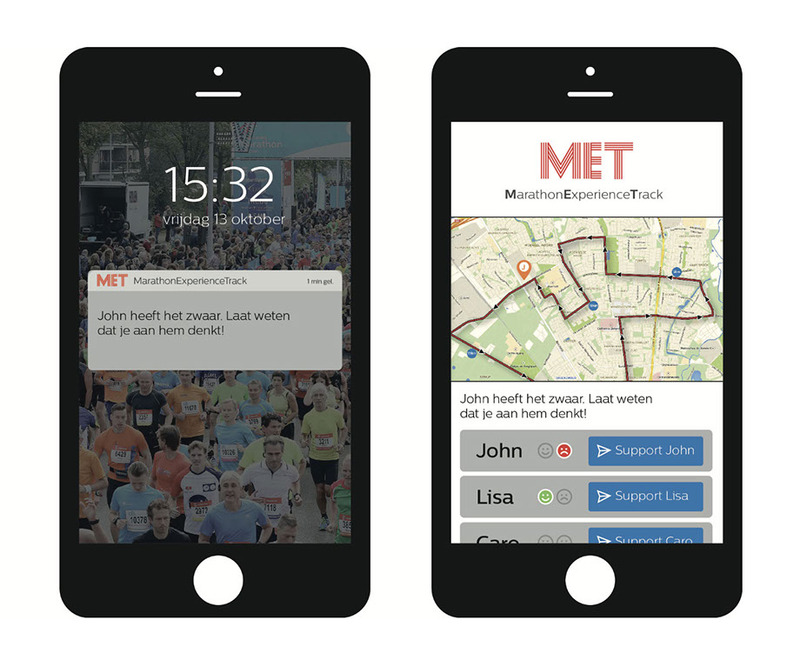 The topic of this hackathon was: "how can we use technology to improve the experience of the Eindhoven Marathon for both spectators and participants?". Every marathon runner can experience emotional difficulties during the race. During these moments support from family or friends would be appreciated. Marathon Experience Track (MET) gives participant and family or friends the ability to connect with each other during these difficult moments without having to be near each other. With a stroke sensor in the shape of a sticker placed on the body of the runner, he or she can send a message concerning the experience at that time. Furthermore, supporters are able to send a "I am thinking of you" message to the runner. The sticker of the runner will light up and vibrate. With MET a new type of data can be gathered for the runner; experience during a run. Project in collaboration with Anne Wil Burghoorn, Iris Roijakkers, Ylja van Miltenburg, Astrid van den Brand.